The owner of the restaurant confirms that the mushrooms probably came from China but they thought they were Spanish. https://business.facebook.com/pg/RestauranteRiffValencia/posts/?ref=page_internal Its interesting that they can't serve good wild mushrooms in a Michelin restaurant in Valencia. If they were shipped from China it seems likely they were dried, frozen or tinned even though the restaurant says they were in perfect condition. Personally I would keep clear of any wild mushrooms from a restaurant or supermarket. That reads like a good recipe. In central Italy wild asparagus is quite common and is more tasty than the cultivated variety and would be perfect in your quiche. I just need to find the morels and the fiddle heads. My mushroom book says that in some parts of Europe Gyromitra are still consumed after some prolonged cooking. To suffer such a strong poisoning you would probably have to eat them raw or be allergic. May be some other mushroom was included by accident. I have been looking out for morels for quite a few years but I have never found them. That tree is a good find. You can keep going back to pick more. Great pictures. What type of tree is that? Thanks for your comment Dave. I found this mushroom growing on a path in open broadleaf woodland. It does not stain when cut or rubbed but is yellowish at the base of the stipe. The flesh smells slightly inky. It has something like a root growing at the base of the stipe. It looks to me like the poisonous Agaricus bresadolanus. 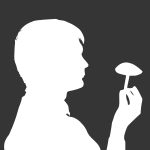 What are the best rules for identifying edible agaricus types? Some people like to pick the A. Caesarea before they have emerged from the veil as white eggs. In that case there isn't so much difference. He might have picked a lot of "eggs" and not spotted the odd poisonous one in his basket. The council office won't check them because picking the eggs is illegal. Personally I wouldn't think of consuming the eggs. A. muscaria poisoning would be bad enough. I'm doing a funghi course at the moment. The lecturer sometimes shows a picture of an edible variety and next to it a similar non edible type. It makes it clear that you have to be careful. They try to prevent admissions to hospital by offering a checking service. In August an entire family in Rome were badly poisoned with Amanita Phalloides that they thought were Amanita Caesarea. I took them to the council offices for checking. They rejected the one that you mention along with other smaller ones. They also removed all the stipes because they say they are indigestible. I asked If I could use them to make mushroom soup and they said certainly not! I had them for lunch. I found these Macrolepiota this morning in a sunny oak wood. Any ideas about how best to eat them? I identify them by the distinctive cap and leopard skin stem with moveable double ring. Is that sufficent? My mushroom book says that Armillariella Mellea have to be boiled for 5-10 minutes to remove toxins. The water is discarded and they can then be consumed or used in cooking. The problem with this is the flavour goes along with the toxins. It looks a bit like Marasmius oreades. My book however says found in meadows and road sides.